Long lasting. Kills fleas for a full 4 weeks. Waterproof even after shampooing and bathing. Activyl for Dogs and Activyl for Cats are spot-on products that contain indoxacarb and a mode of action called bioactivation-it uses enzymes inside the flea to activate serious flea-killing power. They are applied to a small area of skin but soon spread. Fleas don't have to bite for Activyl to work; simply coming into contact with the skin is enough. By stopping flea eggs and larvae, in addition to killing adult fleas, Activyl breaks the life cycle. This is effective at both killing and preventing infestations at home. Activyl for Cats- Place the product at the base of the skull to help prevent your cat from licking it. Squeeze the applicator firmly, applying the entire contents directly onto the skin. Activyl for Small Dogs- Place the applicator tip against the skin between the shoulder blades. Squeeze the applicator firmly, applying the entire contents directly onto the skin . 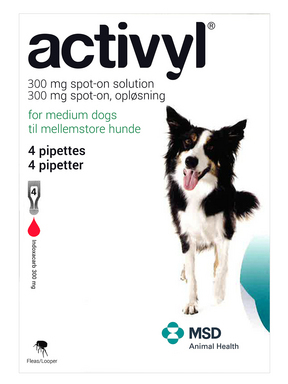 Activyl for Medium to Large Dogs- Apply entire contents of the applicator evenly to two, three or four spots on the back- from between the shoulder blades to the base of the tail. At each spot, part the hair and apply directly to the skin. Do not apply an excessive amount of solution at any one spot. To prevent harm to you and your dog, read entire label and directions before each use. Do not use on dogs and puppies under 8 weeks of age and weighing less than 4 lbs. It is recommended to reapply every 30 days or as needed but do not apply more than 1 applicator per month.